Because you all know that I can't handle more than a beach wave and when I try, I get this, I am bring you someone who knows what she's doing! Meet Lauren from The Craft Ginger, who happens to also be a hairstylist!! Happy Friday friends! My name is Lauren & I blog over at The Crafty Ginger! I am married to an amazing man, a hairstylist, zumba instructor & influencer on Pinterest. I love blogging & I'm really trying to get involved in the community that blogging has to offer! I love meeting new people in the blogging world & in real life. I am also on Twitter, Facebook, Instagram & Pinterest. I'm so excited to be guest blogging over here at Chasing Davies. It's nice to have another blogger from the KC area! I absolutely love Megan's style! Today, I am showing you how to do a quick & easy style for your hair! It's super cute & perfect if you don't have a lot of time on your hands! 1: You are going to start off by parting your hair where you want it. 2: You are then going to section off where you want your braid & where you just want hair to go back in the messy bun. 3. 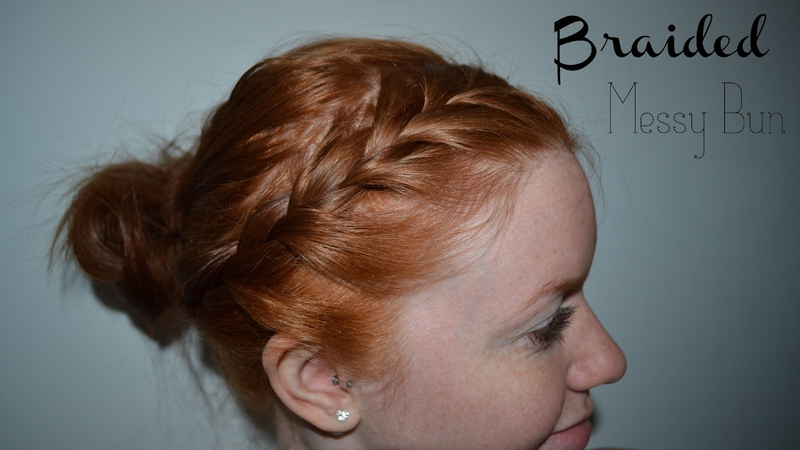 Then, starting at your part, french braid loosely all the way down and move the braid toward the back of your head. 4: Bobby pin the braid in the back. 5: Now, you can either do the same thing on the other side or just leave it plain and continue onto step 6. 6: Take all of your hair and put in low messy bun.